I got lazy. And was extremely hungry, so I did not document the entire process for your viewing pleasure. But you CAN see the end result! And when the Italian Stallion walked in to see what I had been up to, he could not contain his excitement. I'd actually really like to eat some more right now just looking at it. I love Italian food. And Italian men, apparently. This took me about an hour to prepare, start to finish. For me, that's fine for a weeknight meal. I don't have kids, and being in the kitchen is my therapy. It's my way to decompress after a hectic day. And I just love the joy that my food brings to the people I make it for. If you don't have that kind of time, this will make a perfect Sunday night dinner. I'm my toughest critic, but sometimes after I take my first bite of something I say, 'Oh man, this is good.' That's when I know I've done it. I'm not thinking, 'Man, I forgot the salt!' or 'why didn't I turn the heat down sooner???'. I can just relish in the fact that to me, I've achieved perfection on a plate. And it's only those concoctions that I dare post on this blog, so get excited! Season each side of the chicken with salt and pepper, then dredge through the flour you've already placed on a plate (you guys are psychic!). Here would be a great opportunity to use bread crumbs instead - for a bit more crispy outside on the chicken. But I was working on a 'let's clean out the pantry and the refrigerator this week' week. If you do breadcrumbs, beat a few eggs, season with salt and pepper, and submerge the chicken in that, then the breadcrumbs. Once the butter is melted and the oil mixture is hot, place the chicken breasts with plenty of space and fry (ugh, I hate that word. And hate to admit that's what I did in my kitchen. But, hey - I'm at least being realistic) until golden brown, about 3-4 minutes per side. Transfer them to a plate and try to keep them warm. But don't stress about it. They'll be just fine. Without cleaning the skillet (for heaven's sake! ), add the mushrooms, onions and garlic and saute for about 2 minutes, stirring occasionally. Now, add the red wine and stir, scraping up all the yummy brown bits from the bottom. Allow wine to cook until reduced by about half - just a few minutes. Now comes the chicken - nestle it ever so gently into the sauce, leaving the top of it above the surface of the sauce. That's where you put the glorious parmesan cheese. Lay it on thick. Turn the heat down to low and cover again. Keep it on the heat until the cheese is melted and the chicken is thoroughly heated. 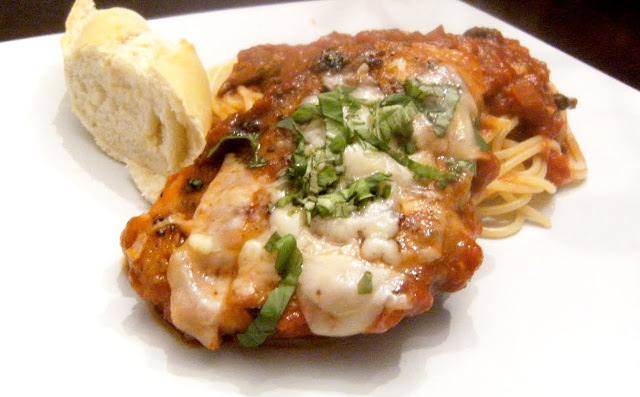 Serve the chicken and sauce over the pasta (add a little parmesan to that, too!) with crusty french bread and a green salad. Garnish with fresh basil and parsley. Perfetto!